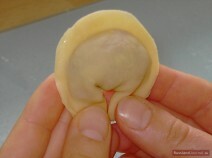 Pelmeni (russ. : пельмени) are in their form like Italian tortelloni stuffed with minced meat. This dish originates from Siberia and was a popular meal among coachmen or hunters on their long trips across this vast and cold part of Russia. Pelmeni were prepared and stored frozen for a long period of time without being cooked. So it was frozen food that could be easily cooked and eaten either at home or on a journey. One only had to light a fire and boil some water or melt snow to cook pelmeni. During long and hard winters this hot and nourishing food was a real blessing. For the dough mix flour with egg, salt and 3 tablespoons of water. 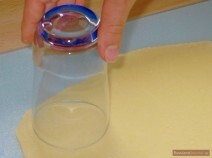 Knead the dough on a lightly floured surface until elastic and roll it thin. 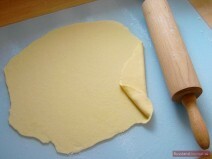 Cut circles from rolled out dough. Fill each cut-out with one teaspoon of minced meat and brush the edges with egg white. Fold one half over to form a semi-circle. Seal and pinch the ends. 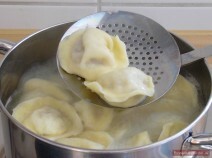 Cook in boiling salted water for about 10-15 minutes until pelmeni float to the surface. Remove carefully with a skimmer and serve on a hot plate. 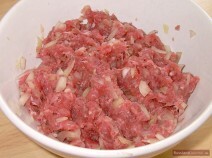 Mix minced meat, onions, some water, salt and pepper. Pour hot melted butter over pelmeni and sparkle with parsley. 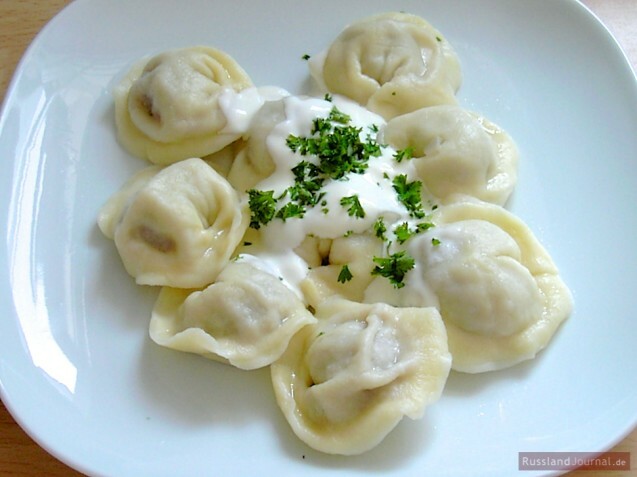 Pelmeni should be eaten hot as they don’t taste once they have cooled down. Use mixed meat or beef instead of minced pork. Use minced beef lever as a filling. In this case pour sour cream into clay pot over pelmeni and bake in oven. Use water instead of egg white. Use dill instead of parsley. RusslandJournal.de visited the Literate Cafe in St. Petersburg (in German) and watched how the cook prepared Sibirian Pelmeni.